This article submitted by Linda Stelling on 8/18/98. 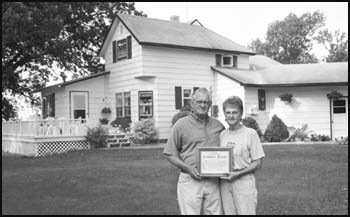 The Clifton and Doris Nygaard farm in Irving Township, Kandiyohi County, was recently honored as a century farm. The farm was purchased by Gustav and Christianna Swedberg in 1898. It was homesteaded by a Williamson family in the 1870s, who had built a log cabin on the site. The Swedbergs lived in the log cabin when they first bought the farm. Gustav bought a three bedroom house in St. Paul and took it down board by board, moving everything to the rural Kandiyohi farm. Doris said their bedroom is part of the original log cabin. When they were remodeling the house, they discovered the log walls. Over the years they have moved and changed many areas of the house. Their present kitchen was once a bedroom. Their latest addition was a deck two years ago. Nygaard bought his grandfather’s farm in 1951. He is the third generation to farm the land. Nygaard built a shop on the farm in 1969 to do mechanic work to supplement his income. The Nygaards farmed the land for many years until 1974 when he decided he couldn’t do justice to both farming and being a mechanic. On July 11 and 12, the Nygaards held a celebration at the farm to celebrate their centennial farm designation. Everybody was home except one son. The couple has five children, 13 grand-children and one great-grandchild. In his retirement, Clifton still works in his shop, restoring old cars and tractors. He is presently working on a Model A Ford for a customer. “I have to have something to do to keep busy,” he said. Doris is known for her quilting in the area. This year she entered a quilt at the Kandiyohi County Fair and won the sweepstakes award. Her quilt will now advance to the Minnesota State Fair.